He died March 31, 1727, in London, England, United Kingdom. Newton actually studied for a degree in law. He owned more books on historical subjects than on science. Isaac Newton suffered two nervous breakdowns. 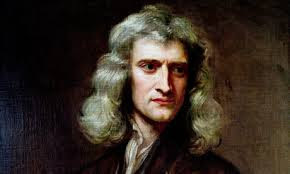 Newton was notorious for his bad temper and conflicts with other people. In particular Hooke and Leibinz. Between 1665 and 1667 the University of Cambridge was dispersed due to The Plague and Newton returned to Woolsthorpe Manor. Isaac Newton become known in the scientific community through his refractive telescope - a big improvement on existing telescopes. Newton's discovered the theory of gravity after watching an apple fall in the orchard. Throughout his life Newton continued research into a wide range of subjects including mathematics, optics, astronomy and alchemy. He was elected as Member of Parliament for the University in 1700, but only held this post for a year. Newton himself would tell the story of an apple falling from a tree giving him inspiration for his work on gravity. However, there is no evidence he was actually hit by an apple! In 1696, Newton was appointed warden of the Royal Mint. He took his duties very seriously, seeking to prevent corruption. Newton was fascinated with religion, though didn't hold orthodox views. He wrote an article on textual criticism of the Bible. English poet Alexander Pope wrote the following epithat for Newton. Isaac Newton was born in 1642 on Christmas day and was born a premature baby. He was born so premature, doctors did not expect him to survive. He belonged to a farming family. His mother had insisted that he manage the family farm at the age of 17. Newton turned out to be a very bad farmer and thankfully for the rest of the world, he went on to study at Trinity College in Cambridge. A large percentage of the discoveries that Newton made were between 21-27 years of age. However, these findings were disclosed to the world only several years later. He became a Lucasian Professor of mathematics at the age of 26. This is a mathematics professorship at the University of Cambridge. Newton’s greatest passion was the bible and he wrote less about science and mathematics and more about religion. He had calculated the date of the Jesus Christ’ crucifixion to be April 3, A.D. 33. In 1668, Newton developed the Newtonian telescope which was the very first functional reflecting telescope. His alchemical studies were kept under wraps while he was alive. Making gold and silver was considered to be a felony and was punishable by law. In his one year stint as Member of Parliament in 1689, the only words he spoke were to an usher. He requested him to shut a window to stop the draft of wind from blowing in. Isaac Newton was appointed the warden of the London Mint in 1696 and was assigned the task of putting an end to counterfeiting. In his early years, Newton was a very bad student and had got beaten-up by a school bully. He eventually managed to challenge the boy and beat him up in return. As a second challenge to prove his mettle he strived to excel in academics and succeeded. This was the turning point of his life. In 1687, Newton published Philosophae Naturalis Principia Mathematica, what is widely regarded to be one of the important books in the history of science. In it he describes universal gravitation and the three laws of motion, concepts that remained at the forefront of science for centuries after.